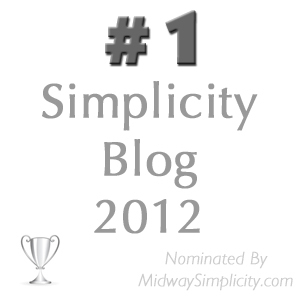 This week for our mini missions we are going to do a little aspiration decluttering. You know the things I am talking about. Those items you aspire to using one day but that day never comes. Why not be realistic and ease the pressure on yourself. Maybe by eliminating seven of those items it will free your mind to actually rekindle an old interest or take up something new you really will enjoy. Choose something to eliminate each day from my suggestions below or come up with your own ideas. Monday – A craft or hobby supply item. Tuesday – A project that you started long ago but have never completed. Wednesday – A gadget you bought to perform a function that rarely or never gets used. Thursday – An item of clothing that you promise yourself is going to fit you again some day. Friday – A piece of sporting equipment that, if you are really honest with yourself, you are not likely to use again. Saturday – A recipe book that you haven’t made anything out of in years. Sunday – Perhaps you have some pet supplies in the garage or shed that you no longer have the pets for. You keep telling yourself you will get another pet one day but in reality you like the freedom of not having to take care of them and of being able to up and go whenever you like and not have to find a carer while you are away. 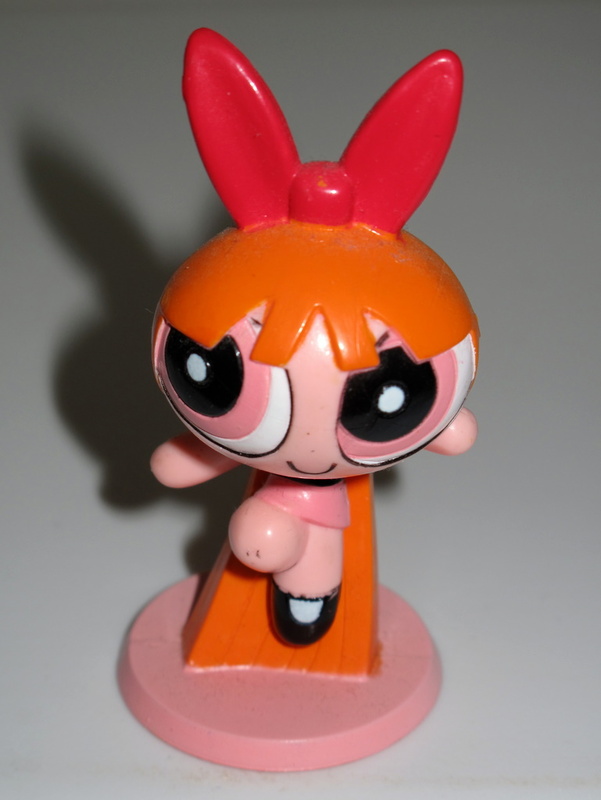 My declutter item of the day and the What am I quiz answer from Saturday is a three inch tall figure of Blossom from the Powerpuff Girls animated television series. She was given to me by some friends I worked with in the USA because she has the same hair as me. Or maybe they thought, like her, I was capable of amazing feats. Sounds right either way. 😆 She has been standing on a storage system in my craft room for years but I rarely look at her. I do however often think of my old friends so clearly I don’t need her to remind me of them. Out you go little redheaded wonder child. Blossom reminds me of how grateful I am that no matter where I have gone in my life I have always made wonderful friends. Friends that I will remember forever. Each place I have lived there has been at least two very special people that have graced my life. Although we usually lose touch over time if we ever run across each other again it is like we have never been appart. I am very fortunate! Oh, wow, never could have come up with the answer for the mystery item! Update on yard sale, Colleen: I had a large area of give-away items and sold other items very cheaply. The items that were left are all being donated to just two places so there isn’t a lot of driving. My basement has a large empty spot now. There is more to be done, but it’s a good start. I love your connection between child birth and garage sales. I can understand what you are saying it is kind of like some sort of self-preservation mechanism that kicks in so you don’t remember how painful things are. I am glad you made some space in the basement and that you are focusing on the result and not that there is still more to be done. Every advancement towards where you want to be is a good one. Jo, I understand perfectly the analogy you chose. Garage sales are so much work, but I am usually so pleased at myself for making some not-too-shabby money, that I forget about the work next time around. I have been giving much thought to the subject of aspiration clutter lately – perhaps because I have so much of it. This is one area of clutter that we can’t blame on anyone else (unlike gifts or inherited clutter) so we tend to be very hard on ourselves for clinging to it. Many of your commenters say they think they’ve failed because they didn’t do, or complete, or excel at something they started. Well, I’ve looked at mine and realize that I have not failed, I have GROWN. Those things were me THEN. This is me NOW. So I’m keeping the stuff I enjoy doing now, and I’m keeping the art supplies, the carving tools and other things I might enjoy in the future. And the stuff from the past is, without regret, going away. great attitude, I was thinking the exact same thing myself last week. Just because we have moved on to something else doesn’t mean we have failed in any way. It is best to be a cup half full kind of person and it sounds like you have that figured out. Well done. Move on and no regrets. I suppose the key to not getting over cluttered with these hobbies and pastimes is to only equip ourselves with just what we need as we go along and not overstock for the future. I have learned that lesson for sure. Well I recently decluttered some aspirational/gift clutter (as in someone dear to me had given it to me) – some drawing pastels. Just today I realised I was a bit hasty as I need to do an album for my brother, and would have used them to do the titles and the like. Oh well, you win some you lose some. I think my aspirational stuff is mainly french books – but I’m dubious to get rid of some of them, cause it’s hard to source them here in Aust. But there are some I got from Freecycle, that I’m unlikely to ever read… And there’s my floristry tool box, a ‘maybe’ on the reuse, but then again, less and less likely seeing I don’t really enjoy it. Thankfully i recently rehomed knee pads from 9 years ago (school), to a parent I know who had brusied knees from shelf packing in the supermarket. I gave them saying ‘if you never use them/throw them out, I’ll never know, but I’ll rest easier hoping you don’t have such sore knees’ and have never said a thing since! declutter regrets fortunately are usually as of little consequence as the one you mention here and not worth hindering our future decluttering over. When I come up against items that I am not to sure whether I am ready to part with I just work in another area for a while. That gives me time to mull over the idea of whether I really need/want the items or not. So long as there are still things to be decluttered there is no need to rush something you are not sure about. Good job rehousing those knee pads, I hope the person’s knees you gave them to are grateful and much relieved. Well, Colleen, this is one area I started on two days ago: and there is plenty still to attack! Zips, ribbons, lace, cottons, metal knitting needles all gone now. This is one Mini Mission I will keep up with…. Of course, that isn’t the only area of my home to be attacked; I am still reading and clearing (that will be at least another year’s worth, I think), and the pantry is in the process of a second pruning – amazing what I didn’t see, the first time through! And on Saturday, my husband and I took two large cartons of stuff to the local hospice shop. My halo is feeling nicely polished, thank you. Now, about the next boxloads to sort …..
you have achieved what it takes to see the job through, enthusiasm! I can tell from your emails that you are on a mission and will not stop until you are happy with the end result, whenever that may occur. Good for you mate! I have been at this for nineteen months now and I never think “when will this ever end” I just do my average of five things per week and I am happy with that. The end will come all in good time and in the meantime I am just happy to be making progress. I decluttered an entire sewing machine table as it was aspirational (and somewhat sentimental) clutter! Well done with the sewing machine. It has gone to someone who will truly appreciate it at least for a while. I have a sewing cabinet that I need to sell at the moment but it is way bulkier than your gorgeous little one. I can’t wait to free up the space it is taking up. Now I just have to work out how I am going to go about getting rid of it. I have one item that was given to me by a friend. It is a collectible tiny perfume bottle. SHE collects them and values them and tells me they are NOT inexpensive. She gave me one for my birthday and was so excited to be gifting me with it that I could not bring myself to tell her I had no interest in it. I fear giving it away because she might ask about it or be looking for it and I don’t want to offend her. But to me it is CLUTTER! What would you do? 1. Explain to your friend that you are minimising your possessions and although the perfume bottle is beautiful it is excess to your needs. Ask her if she would like it back. One would hope that your friendship is more important than whether you keep this item. 2. Keep it regardless of the fact that you don’t want it just to keep the peace. Keep in mind that she may not be the least offended that you should offer it back to her. 3. Get rid of the item without her knowledge in the hope that she will never comment on its absence. I personally usually just get rid of the item and no-one has ever asked where something has gone. I have also opted for the first choice in the past without any problems arising. But to me number two is not an option I would take. My home is my space and it is my choice what I keep in it. Any relationship that is compromised by something as trivial as this was on pretty weak foundations in the first place. Others may not agree with this but that is where I stand. I hope this is of help to you but ultimately it is up to you. I’m going to weigh in and suggest you offer it back. I think she will notice, since she’s such a good friend, and I think she will care because she’s indicated that they are not cheap, and she loves them. I haven’t thought a great deal about this, but I think I’d go in with the “my beautiful bottle wants to live with you and the other bottles at your house. I can visit it there” approach. Good advice Cindy. These situation are awkward but they need to be faced one way or another. I have some gardening aspirational clutter that I ought to be rid of, but I still think “I’ll use that.” I know this sounds crazy, but they’re two thrift store tourchiere lamps (upward pointing). My plan is to literally plant the bases in the ground about 5′ apart, grow vines up and between them, and plant the upturned lamp shade with a dry, heat loving succulent. Together, the whole structure would hide my trash cans from the street, as well as add an arty coolness to my side yard. Ok, here’s my promise. We’re in a drought now, and it’s been over 100 degrees (35C) for 61 days, so I’m not planting anything anywhere until it cools down some and rains again. But if I don’t have my funky trellis assembled by the end of the year, out the lamps go. They’ve already been here for more than a year, so I probably won’t die without them. I think I will trust you to have that trellis assembled by the end of the year, simply because it does sound like a good idea. You have kept them for a reason but your plans have been thwarted by the weather and that seems like a reasonable excuse. I have plans of dropping in to see you in May next year if you think you will be around so I will check then to make sure you either used them or got rid of them. Neat idea, Cindy! It’s frustrating when we are ready to do something and are thwarted by forces beyond our control like weather or illness. I hope your hot spell breaks soon.